The Eastgate Theatre in Peebles played host to some of the Borders’ most exciting dance and choreographic talent at a double-header event. The annual Evie Douglas Choreography Challenge was founded in memory of local dancer Evie Douglas, both a former pupil and teacher at the Fiona Henderson School of Dance in Peebles. Evie, who took her own life in 2014 at the age of 21, loved dancing, so her mother Freda got together with Fiona to organise this unique celebration of both Evie’s life and the untapped talent to be found in the Borders. Freda said: “Evie struggled with depression and mental health, but she always said: ‘When I dance, I’m free’. “It was the only time she was truly free of her demons. “Evie was about to study contemporary dance at Trinity Laban Conservatoire of Music and Dance in London. Evie Douglas who committed suicide in 2014 gives her name to this annual event. “Unfortunately, she took her own life before she could go there. “I have set up a scholarship at the conservatoire as well in her name. If I can allow other young people to be able to dance, it sort of keeps her spirit there as well. 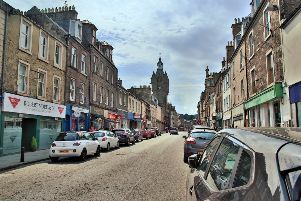 Freda said that this year’s event in Peebles brought in the largest entry to date in the three years that the challenge has been in existence because, for the first time, it had been opened up to include any dance school in the Borders. And the panel of three independent judges was very impressed at the standard of performances. Natalie Beatton won with her piece called Beyond the Boundaries. Second place went to Noee and Gabrielle Sellar for Dream, and third place was awarded to Bronwyn Lewis and Eilidh Naysmith for Home. The Fiona Henderson School of Dance (FHSD) also held its annual scholarship awards on the same day. All the entrants were put through their paces in a masterclass audition class at the FHSD studios by school principal Fiona Henderson in front of a panel of independent judges. The FHSD scholarship awards were created to recognise, reward and encourage talented dancers in the Borders. Nina McDowall won the junior scholarship award and Olivia Murray won the juvenile scholarship award. In addition to their winners’ plaques, both girls also received a prize worth around £450, consisting of a free weekly dance class for one academic year, as well as a series of private lessons. Fiona said: “The standard for this year’s scholarships was really high, so both winners are to be congratulated for being chosen by our independent judges, who were impressed both at their current standard and ability as well as their future potential, which both winners showed. Olivia Murray is presented with the junvenile annual scholarship award by judge Racel Mearns. The judges were Rachel Mearns – head of the Aberdeen Academy of Performing Arts and AAPA Casting; Eileen Graham, former championship dancer and founder of the Graham School of Highland Dancing; and Noel Proven, founder of the Manor School of Ballet.